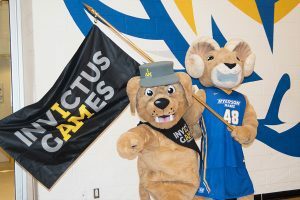 The Invictus Games first took place in London in 2014 as a demonstration of the strength of soldiers and veterans. 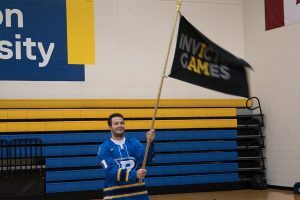 Three years later, it’s Toronto’s turn to host the games. More than 500 competitors from 17 countries will compete from Sept. 23-30. 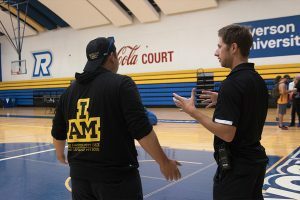 Greg Danko (right), is the National Tour Co-ordinator for this year’s Invictus flag tour. 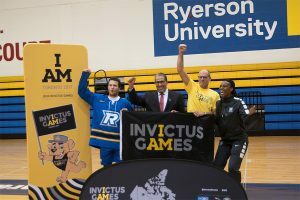 The Invictus Games Opening Ceremony will take place at the Air Canada Centre on Sept. 23 at 7:30 p.m. 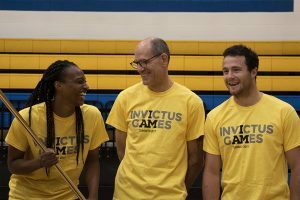 The three flag bearers sported an Invictus 2017 tee. Chris Munro (middle) is a Canadian Armed Forces veteran. He began operating the Bridges to Ryerson program through Ryerson’s Chang School of Continuing Education. 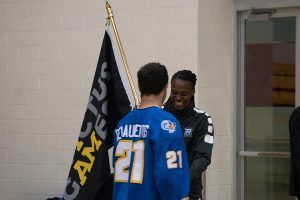 The program assists people who want to return to school and has been a successful path for veterans and current members of the Armed Force. Left to right: Tashana McDonald, Chris Munro and Erick DeLaurentis.